Mad Men always maintained an odd relationship with history, incorporating major ‘60s events, but keep Sterling-Cooper and Don Draper’s work somewhat obscure in the advertising world. No longer, it seems, as Heinz has officially adopted an abandoned ketchup pitch from Mad Men Season 6 for use in the real world. As outlined in AdWeek, Heinz will make a short run of the ketchup ads conceived by Don and the Sterling-Cooper-Draper-Pryce team in Season 6, which deliberately excluded an actual ketchup bottle to place the image in consumers’ minds. Heinz ultimately rejected the abstract pitch in-show, but will now feature the ads in the New York Post, Variety, and even an NYC billboard. And yes, credited to Don, Matthew Weiner and the agency. Even though Don Draper created the ‘Pass the Heinz’ campaign almost 50 years ago, the communications still really work in today’s world. 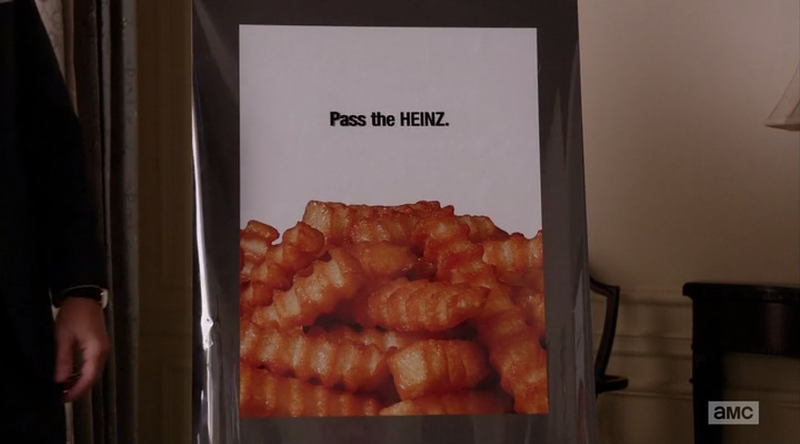 Mr. Draper really understood the one thing every Heinz fan knows, which is to never settle for the foods you love without the great taste of Heinz. What we loved about the campaign is that it doesn’t require paragraphs of copy to explain it. It features mouthwatering food images, and all that’s missing is the Heinz. Heinz’s actual ad agency David Miami even joked about meeting with a 91 year-old Draper to discuss the campaign over Old Fashioneds, but Jon Hamm would probably beg to differ in that regard. In the meantime, watch the Season 6 scene in question below.